If you’re struggling with your housekeeping routines, you’ll want to read this post. Currently we have seven people living in our house. Five of those people are ages 8 and under. The place gets messy fast, and if I don’t have some sort of system in place things can get out of control. Today I want to talk about how to make a cleaning schedule. You’ll learn how to put together a cleaning schedule and how to get on track even when you can’t follow it perfectly. I use my monthly cleaning calendars as a schedule to follow. Currently, I have tasks broken up throughout the week. I work on one “zone” or area of my house each week. I have my home divided into eight zones and I cycle through them. I do one zone task per weekday. This cuts my cleaning time down to around 30 minutes a day (not including folding laundry) and I do not have to do anything on the weekends other than daily tasks. So, I make my schedule work for me, I do not work for it. Sometimes we are out of the house all day running to appointments. Weekly and zone cleaning tasks may not get done. In this case I work on a looping system. I just do the next thing that needs to get done, and I may use the weekend to catch up on any cleaning that I missed throughout the week. There are also instances where it is easier for me to complete my zone cleaning in one day rather than break it up throughout the week. Right now I have two toddlers, so when it’s time to deep clean the bathroom, my husband keeps the kids entertained and I take an hour and do the entire room. It is important to remember you are doing the best you can. The schedule is a reminder of things you would like to clean, but sometimes things just don’t go according to plan. Pick up where you left off, and everything will be okay! 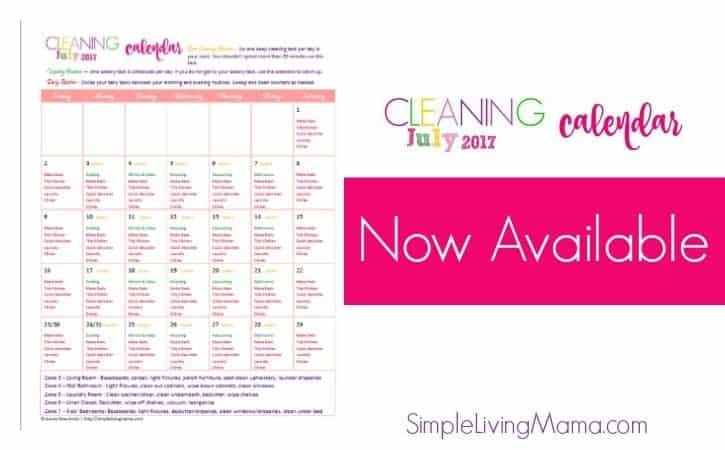 I offer my monthly cleaning calendars to subscribers for free! Lovely ideas but every time I start making some plan something happen and everything has changed at the last moment and I should worry how to do everything on time. I’ll try your cleaning schedule. Thank you.